Restoring streams to a stable form through natural channel design requires detailed information about surface water hydrology and the interactions between rainfall and overland flow or runoff. 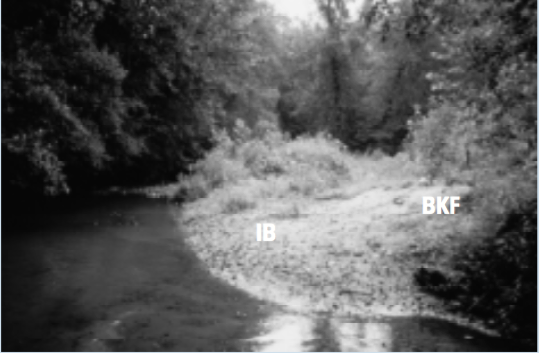 The channel-forming or dominant discharge is the most common method for sizing channel dimension if the stream restoration requires re-shaping the channel. Channel dimension is the cross sectional shape of the channel, including channel width, depth, and cross sectional area. Dominant discharge is a theoretical discharge that if constantly maintained in an alluvial stream over a long period of time will produce the same channel geometry that is produced by the long-term hydrograph. Effective discharge is defined as the discharge that transports the largest percentage of the sediment load over a period of many years. 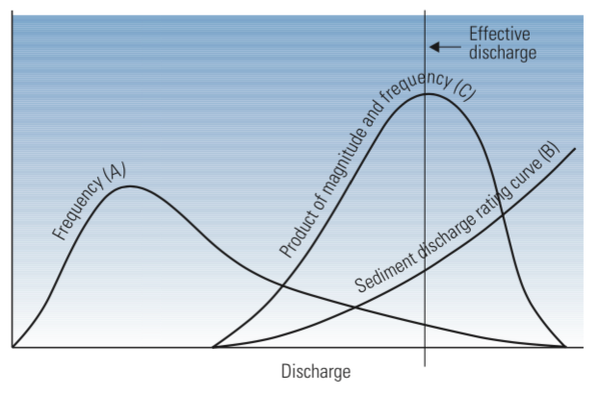 Effective discharge is the peak of a curve obtained by multiplying the flood frequency curve and the sediment discharge rating curve (Figure 1). Bankfull discharge is the discharge that fills a stable alluvial channel to the elevation of the active floodplain. This discharge is morphologically significant because it identifies the point where the active channel stops and the floodplain begins. In other words, it represents the breakpoint between the processes of channel formation and floodplain formation. Since bankfull discharge is the only discharge that can be identified in the field using physical indicators, it is the one most commonly used in natural channel design. Most river engineers and hydrologists work under the assumption that dominant, effective, and bankfull discharges are approximately equal. This assumption has not been proven true in the Southeast; however, the differences will probably not significantly affect a natural channel design. Figure 1. Effective discharge determination from sediment rating and flow duration curves. The peak of curve C marks the discharge that is most effective in transporting sediment. (Wolman and Miller, 1960). The height of water, or stage, during bankfull flow is the point at which flooding occurs on the floodplain. This may or may not be the top of the streambank. If the stream has downcut due to changes in the watershed or streamside vegetation, the floodplain stage indicator may be a small bench or scour line on the streambank. The top of the bank, which was formerly the floodplain, is called a terrace in this case. A stream with a terrace near the top of the banks is an incised, or entrenched, stream. If the stream is not entrenched, then bankfull is near the top of the bank. On average, bankfull discharge occurs approximately every 1.5 years. In other words, each year there is about a 67 percent chance of having at least one bankfull streamflow event. The bankfull event can occur any number of times per year. The Rosgen stream classification system uses bankfull stage as the basis for measuring the width/depth ratio and entrenchment ratio, two of the most important delineative criteria. 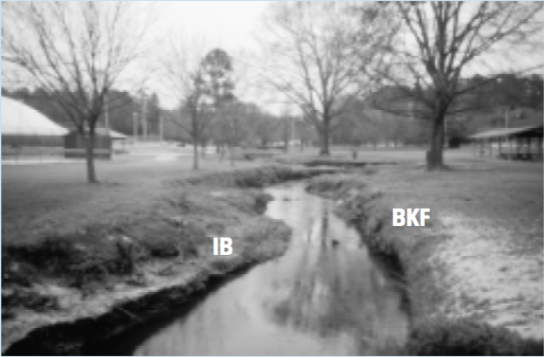 Therefore, it is critical to correctly identify bankfull stage when classifying streams and designing stream restoration measures. The Rosgen stream classification system is discussed in detail in Application of the Rosgen Stream Classification System in North Carolina, AG-590-2. The most consistent bankfull indicator in North Carolina streams is the uppermost scour line. Other bankfull indicators include the back of a point bar, the upper break in slope of the bank, and occasionally the top of the bank. Often, there is another prominent feature known as the inner berm. The Army Corps of Engineers refers to the inner berm as the mean high water mark. This feature is usually identified as a scour line or small bench halfway between the low flow water surface and the bankfull stage. While this feature is morphologically significant, it is not the dominant discharge and should thus not be used for sizing a channel. Examples of bankfull indicators are included in Figure 2a, Figure 2b, Figure 2c and Figure 2d. Figure 2a. Mills River Gage, Henderson County, C4 stream type. 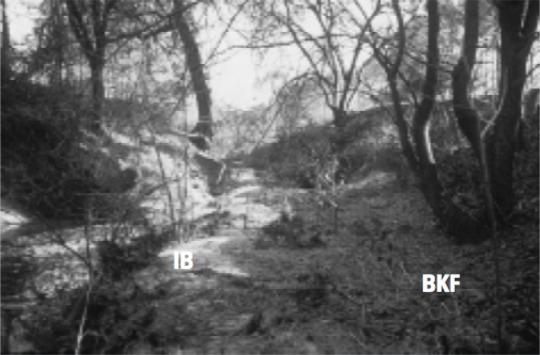 The break in slope at the lower bench is the inner berm (IB). 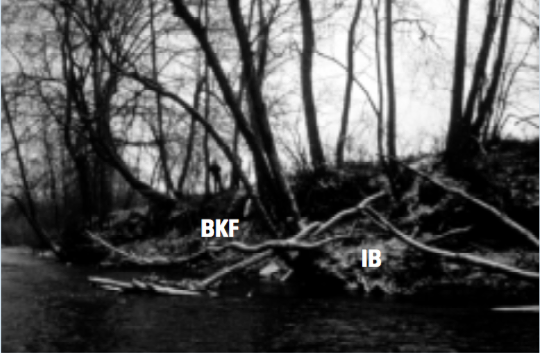 Bankfull (BKF) is the upper scour line. Figure 2b. Rocky Branch, Wake County, G4/F4 stream type. This stream is actively building a new floodplain. The front of the bench is the inner berm and bankfull is the back of the bench. Figure 2c. South Fork Mitchell River, Surry County, C4/E4 stream type. Bankfull is rarely the top of a point bar. However, where there is an excessive upstream sediment supply, a point bar will build to bankfull as shown. Inner berm is the lower bench. Figure 2d. Hominy Creek, Wilson County, E5 stream type. Bankfull is the break in slope near the top of the bank. Notice the deposition on the floodplain. The inner berm is the lower bench inside the channel. Bankfull hydraulic geometry relationships, also called regional curves, first developed by Dunne and Leopold (1978), related bankfull channel dimensions to drainage area. Gage station analyses throughout the United States have shown that the bankfull discharge has an average return interval of about 1.5 years or 67 percent annual exceedence probability. The primary purpose for developing regional curves is to aid in identifying bankfull stage and dimension in un-gaged watersheds and to help estimate the bankfull dimension and discharge for natural channel designs. 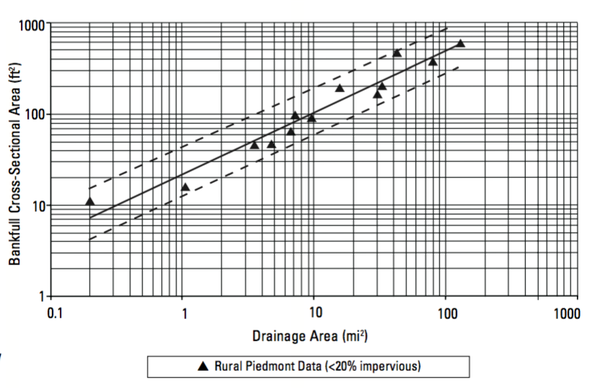 The bankfull cross sectional area vs drainage area regional curve for North Carolina rural piedmont is shown in Figure 3. Details about the development of regional curves and additional data for the rural piedmont of North Carolina are discussed by Harman et al., (1999). Additional curves for North Carolina physiographic regions will be posted on the NC State Stream Restoration Program website as they are completed. Figure 3. North Carolina rural piedmont curve. The following steps should be taken for identifying and verifying the bankfull stage in the field on an un-gaged stream. Using a USGS quad sheet or similar map, determine the drainage area in miles squared for the watershed/stream section of interest. Calculate the percent of impervious cover for the watershed of interest. Using the indicators listed above, walk upstream and downstream for a distance of at least 20 times the bankfull width and flag the bankfull indicators. Use a survey rod to measure the difference between the bankfull indicator and the current water surface along the study reach. The variability of this difference should not be more than 6 inches. For your watershed area and percent impervious cover, compare the field estimated bankfull cross sectional area to the area on the regional curve for that stream’s hydrophysiographic region. If it is close to the regression line (between the upper and lower 95 percent confidence limits, dashed lines on Figure 3) AND the feature is consistent for 20 bankfull widths, then this feature is (most likely) the bankfull stage. If the measured bankfull cross sectional area falls outside of the 95 percent confidence limit, the following steps should be taken. If the point is below the lower 95 percent confidence limit, make sure that the feature is not the inner berm. Typically, the inner berm has roughly half the cross sectional area as bankfull. Look for other features above the inner berm, such as an upper scour line or break in slope that are consistent for a longer distance upstream and downstream of the cross section. If the point is low, be sure there is not an upstream impoundment. If the point is above the rural curve but below the urban curve, it may be part of a separate relationship for suburban development. Visit a nearby gage station and check the return interval for BKF. It should be between 1 and 2 years. Finally, know your watershed! Factors such as stream type, impervious cover, topography, channel materials, sediment transport, and bank vegetaion all contribute to the size of a bankfull channel. Figure 4. Xi represent cross-section distances (widths) from left pin. Yi represents location & reading of a bankfull depth. Dashed line equals the calculated mean depth for a section. Shaded rectangle shows example of sectional area. Successfully identifying bankfull stage is the crux to any stream restoration design. With practice and experience, bankfull can be identified correctly and consistently in stable and moderately unstable streams. Regional curves should be used as an aid in verifying which morphological feature is or is not bankfull. When possible, gage stations near the project site should be surveyed and compared to the regional curve. If a gage station is surveyed, the bankfull stage should be carried through the gage plate to obtain a bankfull discharge from the stage/discharge relationship. 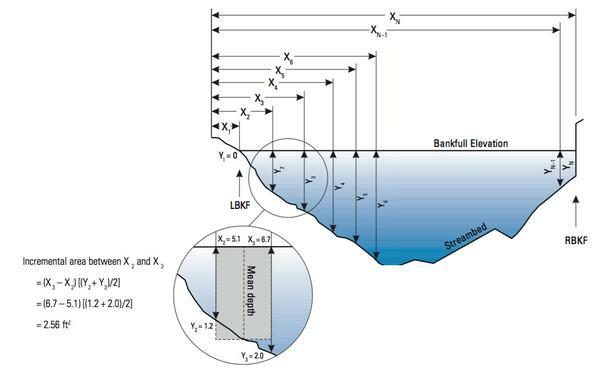 Using the bankfull discharge and Log Pearson Type III flood frequency distribution, a return interval or exceedence probability can be obtained. The return interval should be between 1 and 2 years. If regional curves are used for natural channel design, other methods such as Manning’s equation or HEC 2/ HEC RAS should be used to estimate the bankfull discharge for comparison. If a sediment/ discharge relationship and flow duration curve is available for the project, then the effective discharge should be used for the design. In all cases, professional judgment is required to make the final design decisions. Therefore, it is imperative that the designer understands the cause and effect relationships governing the morphology of the channel. Dingman, L.S. 1994. Physical Hydrology. Prentice-Hall, Inc. Upper Saddle River, NJ. Dunne, T. and L.B. Leopold. 1978. Water and Environmental Planning. W.H. Freeman Company. San Francisco, CA. Harman, W.H. et al. 1999. Bankfull Hydraulic Geometry Relationships for North Carolina Streams. AWRA Wildland Hydrology Proceedings. AWRA Summer Symposium. Bozeman, MT. Rosgen, D.L. 1994. A Classification of Natural Rivers. Catena, vol 22: 169-199. Eisevier, B.V. Amsterdam.